Motherhood isn’t just a station in life, it’s a ministry. 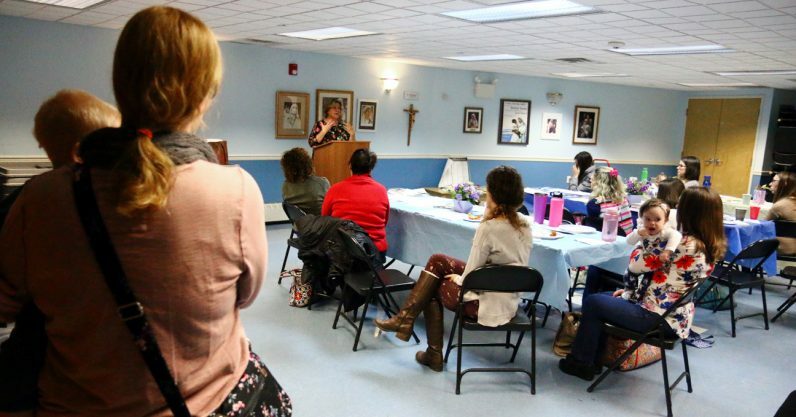 Certainly that is the view MOMS (Ministry Of Mothers Sharing), a group of women who meet monthly at St. Pius X Church, Broomall. Most are mothers, but not necessarily. Some are grandmothers, others are simply motherly. 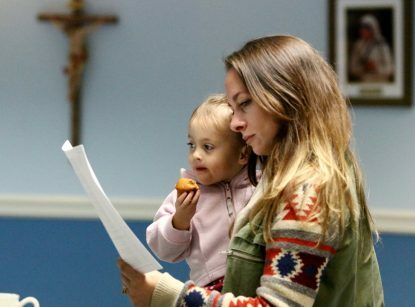 While most are Catholic, others are simply women searching for faith-based support. Although Albanese is clearly the spark who keeps it going, MOMS is not a formal organization in the sense there is a president and officers. She and her husband are parents of five children ranging from 10 years to eight months – Jacob, Raphael, Theodore, Samuel and Lillian. 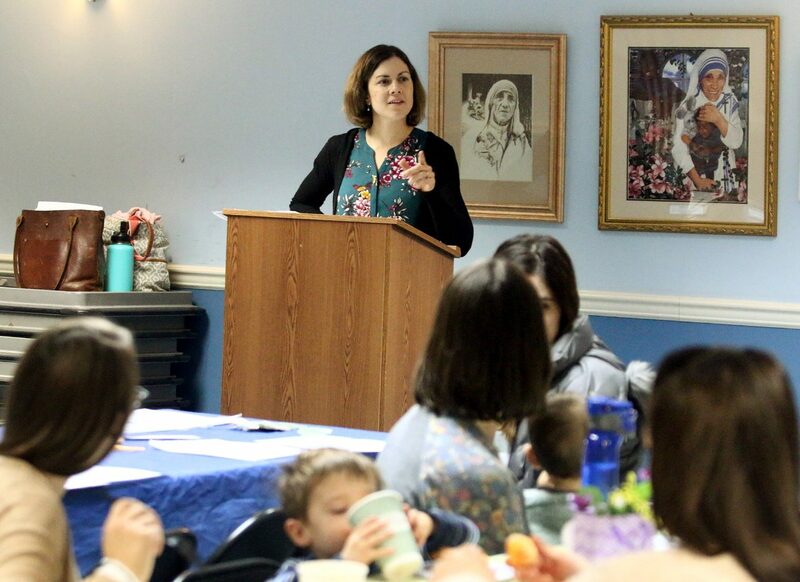 The group usually meets in the morning of the last Friday of the month, September through May, in the basement of the church; for the members bringing preschoolers free babysitting is provided in an adjoining area. It’s just an opportunity to relax with like-minded women, pray, share stories, drink coffee and perhaps have an interesting guest speaker. Gallagher herself is a mother of four ranging from 10 years to 10 months — Mary, John Paul, Gianna and Michael. For her the support given by the group is really important, because after each of her pregnancies she experienced post-partum depression, and the group has helped her through this. Especially helpful was Melanie Winter, another member of the MOMS group. She is a nurse practitioner who not only counseled Danielle, but gave a lecture on post-partum depression at a MOMS meeting. Winter is a mother of five, Kyle, Hanna, Luke, Evan and Katrina ranging from 19 to 5. 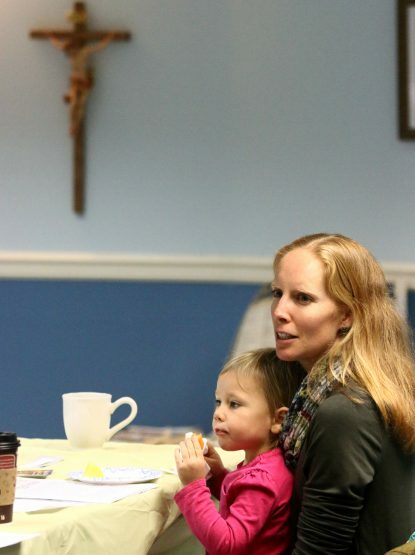 Although her children are birth Catholics, “I’m a convert,” she said. “I love the group, it has been a great source of strength for me. You are in fellowship with other women who are in the same phase of life as you and there are older women who raised their children and they have wisdom. While some of those who attend the MOMS meeting come a distance, there are other similar groups popping up, according to Albanese. “There is one at St. Joseph, Aston and one of my friends started one at St. Francis, Springfield,” she said. For more information concerning MOMS contact Sarah Albanese at sarah.albanese@gmail.com.